The children get to know the donkeys, learn about the long ears, brush and caress the animals. Every child can be with a donkey in the enclosure to make a small course and depending on the weather / time / age of the children you also may ride on a donkey a small round. In the haystack the birthday party is celebrated and the Cake can be eaten. There is also time to open the gifts - if desired. Then there is still time for a playful activity. This is very good game called treasure hunting. There will be questions about donkeys and only with the right code word the treasure can be recovered. 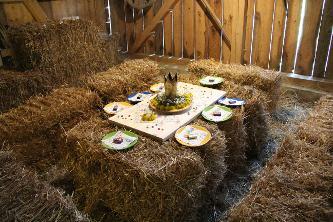 The birthday table will be made in the hay (see picture above on the right). Plates / napkins / cups are ready. Likewise, syrup. From 5 children (depending on the age). Two, depending on the situation also three companion recommended. Otherwise, no riding facilities may be offered.